Drawing on the depths of Shambhala and Buddhist teachings, Being Brave will explore how meditation practice develops a greater sense of interconnectedness, and rouses strength to cultivate enlightened society. How can we apply inner peace and bravery to develop outer compassionate action? Global spiritual wisdom speaks to an inner and outer transformation. When we open our hearts to meet fear with bravery, we can begin to connect with the fundamental practice of compassion and the recognition of our shared humanity. 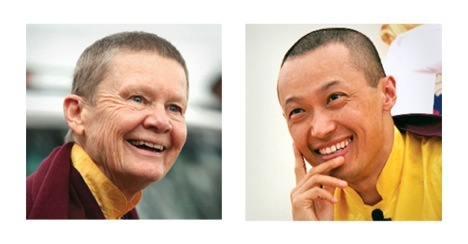 The Sakyong and Pema Chodron will be teaching in Northern California May 2 - 4. The teachings will also be available by webcast. The topic is "Being Brave: Is enlightened society possible"? More information is available at http://www.creatingsociety.com/ and provides information on the topic, the teachers, and logistics. Information on the webcast is available at http://streamingbrave.org/ . If three or more people are interested in viewing the webcast then we could register as a group. We would have to work out the logistics on how to set up the area for the group. Adobe Connect is used for the webcast and technical requirements are here http://shambhalaonline.org/index.php?id=5000 and http://www.adobe.com/products/adobeconnect/tech-specs.html . Friday, May 2 – program from 7 to 9:30 p.m.
We can talk about this over the next two Sundays and decide at the end of the month. If this time is not practical, maybe in the future we could do this as a group.